The 60,647 votes in Galway West have been counted, counted, and counted again – and elected five TDs this morning. The Galway West count was the last to conclude, with other constituencies finishing their counts by 6am yesterdya. THE LAST OUTSTANDING constituency to officially declare its results in the general election, Galway West, has returned its five TDs this morning – bringing to an end all counting in the 2011 election. Shortly after 8am this morning, returning officer Marian Chambers Higgins confirmed that a second recount had not seen independent councillor Catherine Connolly close her 17-vote deficit behind Fine Gael’s Seán Kyne – and declared Kyne and four others to have been elected. Both Kyne and outgoing independent Noel Grealish had been elected by virtue of Connolly’s elimination, and join Fianna Fáil minister Éamon Ó Cuív and Labour councillor Derek Nolan in the next Dáil. Boxes had been first opened in Galway West at 9am on Monday, and a second recount has concluded at the count centre in Salthill, with the local returning officer now confirming the results of each of the 13 counts that had been concluded. Counting had stalled first on Sunday afternoon when Fine Gael senator Fidelma Healy-Eames sought a full recount, after the tenth count had shown her trailing party colleague Kyne by 56 votes. A recount began shortly after 7:15pm on Sunday, but the results of the revised first count were not answered for another 26 hours. Healy-Eames’ appeal proved fruitless, though, with Kyne’s supremacy remaining at 45 votes. But as the recount concluded at 6am yesterday, independent councillor Connolly immediately sought – and won – a full recount to try and make up the 17-vote deficit between herself and Kyne, the nearest candidate. That second full recount began yesterday at 4pm, and has continued overnight, but it is believed unlikely that any revised result will have any material changed – allowing returning officer to confirm, and formally declare, the five successful TDs. The confirmation that the five have been elected means the make-up of the 31st Dáil will be as follows: Fine Gael 76, Labour 37, Fianna Fáil 20, Sinn Féin 14, United Left Alliance 5, others 14. Email “Results in after epic 73-hour count in Galway West”. 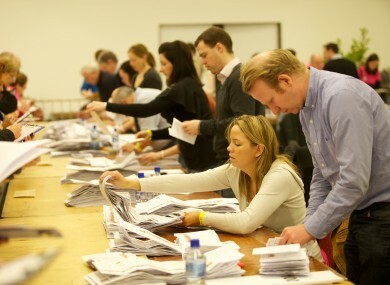 Feedback on “Results in after epic 73-hour count in Galway West”.